Between two and four implants can be used to stabilise and removable dentures in both the upper and lower jaw. 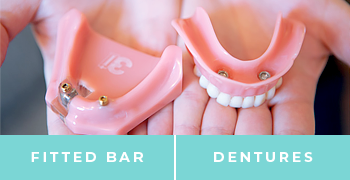 We make a special new set of dentures that is designed to clip onto the attachment or bar which is fitted to the implants. This in fact preserves jawbone and makes it easier to eat. We can provide you in house consultations with either Mr Derek Goodisson who is the Oral Surgeon for Hawke’s Bay, or Dr James Talbot who visits regularly from Wellington and has a vested interest in more complex restorative and surgical procedures including implants. In our image conscious society there is an increasing emphasis on maintaining a youthful appearance or enhancing what nature has given us. Dental implants are now proven to be the most successful and permanent way of replacing a single tooth, several teeth or a full set of teeth. We are a family based practice that believes totally in the philosophy that prevention is better than cure. Our aim is to provide a tailor-made long-term preventative program to keep your teeth and gums in the best possible health which should minimise the need for treatment long term. Now you can budget for routine dental care by spreading the cost over 12 months. Dental Essentials is a convenient and affordable dental plan that takes the financial 'ouch' out of visiting the dentist. Our exceptional family-based practice takes pride in providing the full range of services modern day dentistry has to offer. We have a strong belief in ongoing education, allowing Aesthetic Dental to provide the most up to date techniques and treatments available.